When there’s snow on the ground you need to adjust your driving to keep safe. Like it or not, the cold weather is here to stay, and along with it comes the potential for snowy and icy roads. When it roads get hazardous drivers need to pay attention and be proactive to make sure they stay safe. Here are a few winter driving safety tips to help you stay safe this season. Really, this should go without saying. Any time visibility or traction are the slightest bit compromised you should know to lower your speed. The tricky part of slowing down on a snowy road, however, is that going too slow can cause you to lose traction or get stuck. Heading up a hill without enough umph could mean you don’t get up the hill at all. The key is to recognize the situation and drive responsibly. This mind sound strange, but the best thing to do when there’s snow on the ground is to let a few pounds of pressure out of your tires. A lower tire pressure will create more contact between the rubber and the road, creating more traction. 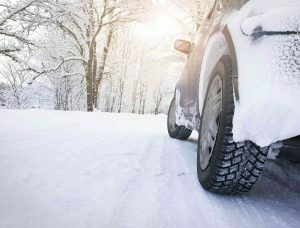 Only use this technique if there is snow on the ground and not bare road, as it will cause your tires to wear more quickly. Not being able to see in a snow storm, or even on a snowy road at night, is a major hazard. Add in driver fatigue and you have probably the most dangerous driving situation imaginable. Always check your lights before the snowy season gets here and fix any problem immediately. An older car battery’s worst enemy is the cold. The average car battery loses 35% of its strength when temperatures hit freezing. If your vehicle, or fleet, isn’t ready for a new battery yet make sure to carry jumper cables or a small portable charging unit. This entry was posted on Friday, December 2nd, 2016	at 10:47 am	. Both comments and pings are currently closed.